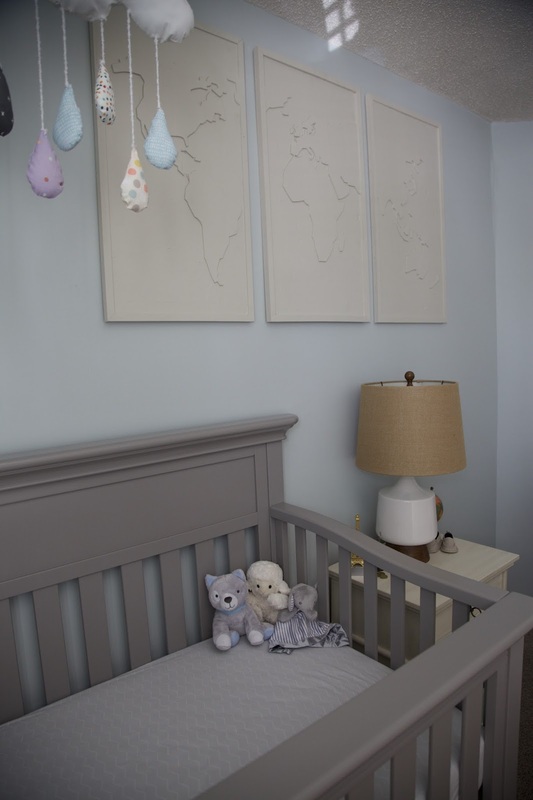 With Baby K on the way in less than two weeks, I'm excited to announce that we are officially done with our gender neutral nursery! 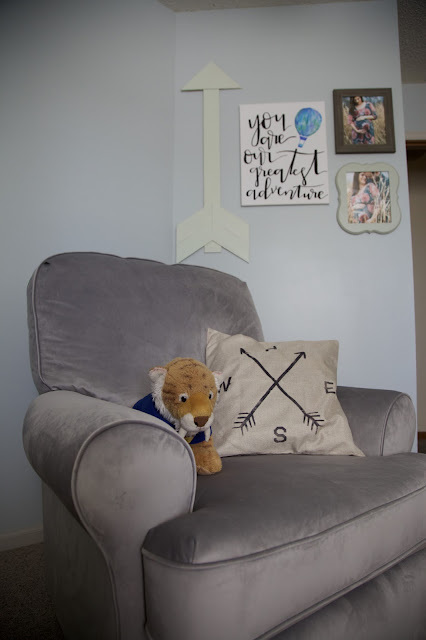 This sweet space started with dark oak trim and hot pink and green walls, and now it's just the right mix of pale gray, white, blue, and green with some pops of beige. Creating a gender neutral nursery was just as fun as I expected, and now we're all set for all of our babies, boy or girl! I'm so excited to be sharing our nursery with you today, and I hope you love it just as much as we do. For the room, we decided to go with calm, airy colors and a fun travel/adventure theme that really captured the heart of our dreams for our baby. 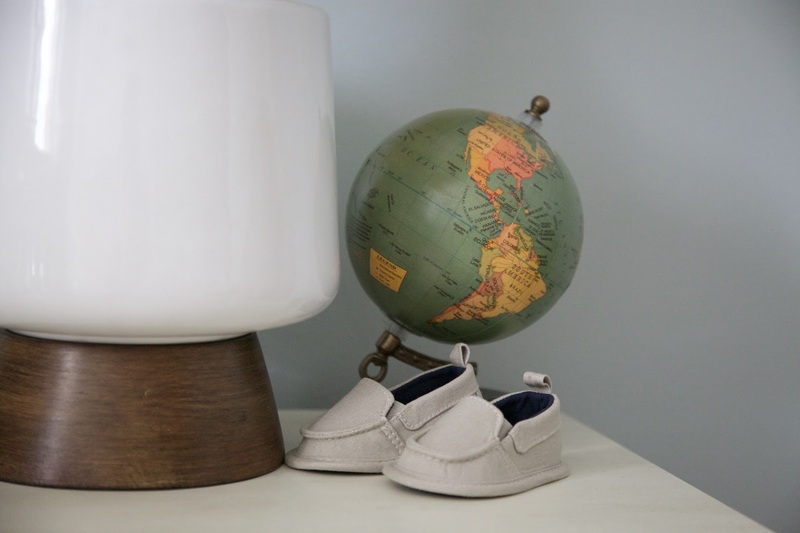 Aaron and I love adventuring through life together, and have shared travels all around the world, and we have the same hopes for our sweet little one. In fact, we feel like them joining our world will be our greatest adventure yet (and I've tried to capture that in our room decor). We have oak trim in all the other rooms of our house, but I was ready for a change in the nursery. We didn't use a pure white, but instead went with Oatlands Subtle Taupe, a color I had used in other rooms of our house to accent, and one that would more subtly transition into the rest of our house. 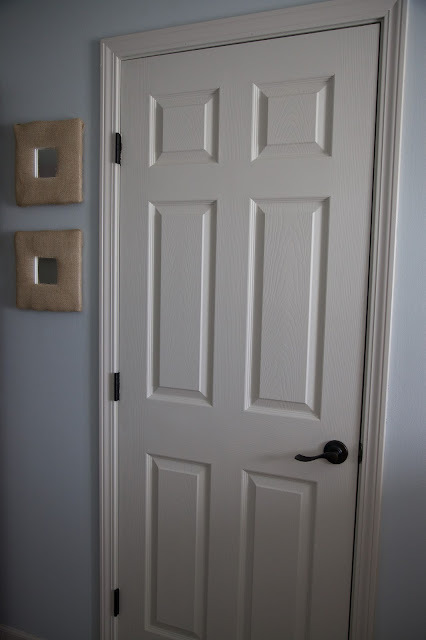 Aaron also bought and finished a new door for the closet. From there, we took the old dresser/changing table from when I was a baby and painted it the same color as the trim. We also bought some (new to us) blinds from our local ReStore that matched the trim just perfectly. Although we had originally planned for Aaron to possibly build our crib, we found an INCREDIBLE deal at Nebraska Furniture Mart in the clearance center. 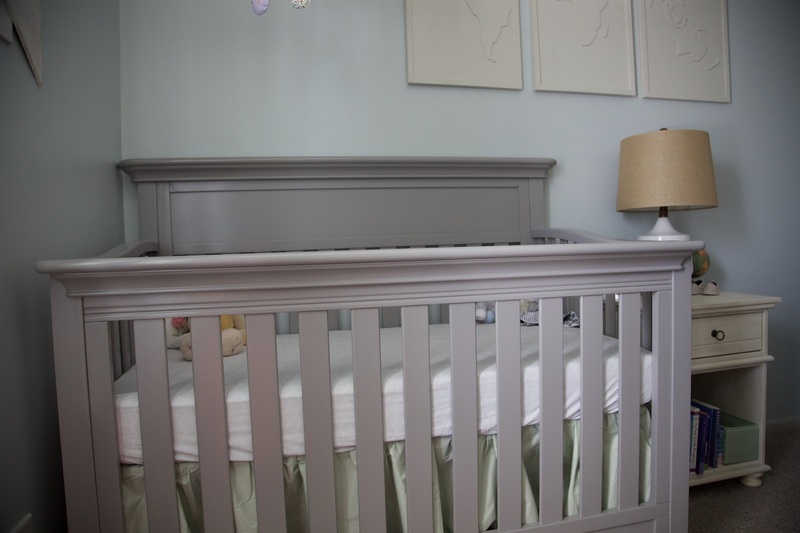 Everything with the crib was structurally sound, and so we brought home this dreamy gray Serta beauty that we would never have purchased for full price. 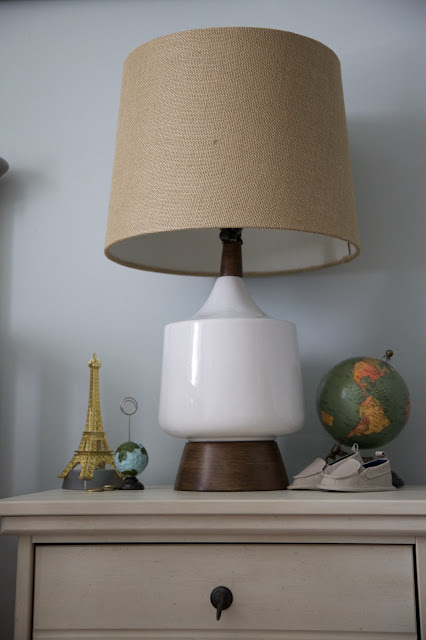 We brought in the nightstand we already had from Nebraska Furniture Mart (clearance center again), and I picked out this fun lamp from the same store after much deliberation! I wasn't sure about it at first, but I really love the way it brings in the burlap texture, which I then continued throughout the room in small doses of decor. This glider/recliner in Dolphin Gray was our big splurge in the room, and I love it so much! I just knew that I would be spending a ton of time in it, so I wanted it to be super comfy. 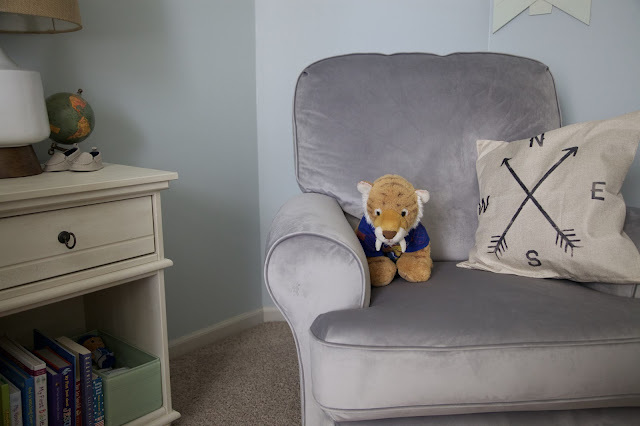 With limited space in the room, we also thought that a recliner would be worth the extra money, instead of going with a chair and ottoman. It's so soft and fabulous and I can't wait to snuggle our little one in it. 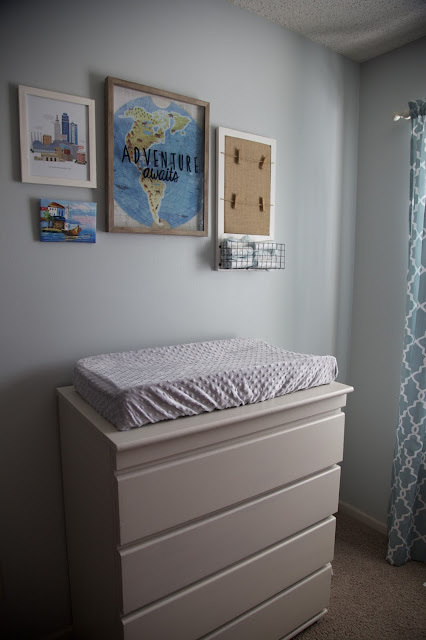 Our crib skirt, the arrow, and the small IKEA containers all bring in pale pops of green throughout the room that tie in with the map idea and also bring a feminine touch in case Baby K ends up being a girl. Rounding out the decor for our travel and adventure theme was SO much fun. 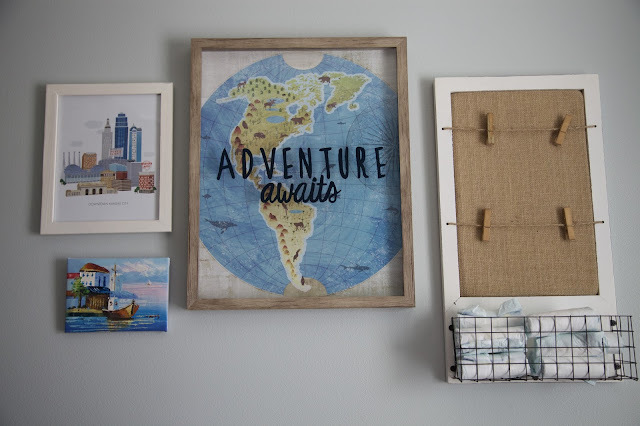 I found this cute "Adventure Awaits" sign at TJ Maxx, along with a cute little globe, and those were actually the first two purchases I made for the entire room. From there, I did a lot of planning and dreaming before finally figuring out what I wanted. 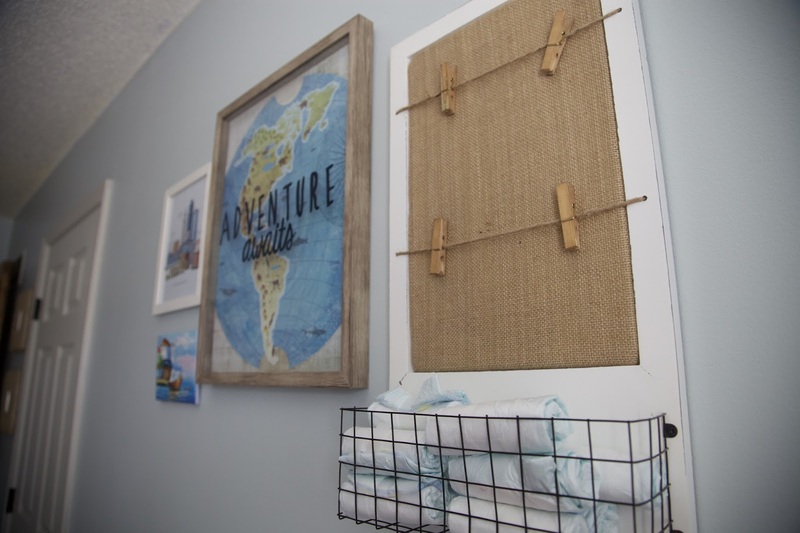 I loved this Burlap Mail Organizer from Kohl's, and thought it would be perfect to hold a few diapers above our changing area. I also loved the burlap and plan to put up fun photos of our adventures with Baby K.
The other two gallery wall items are a fun Kansas City print that we won in a Christmas Gift Exchange (representing home), and a painting that we bought on the street while we were in Greece this summer (and I was newly pregnant). After much debate, I finally landed on curtains from Walmart in a pretty pale blue/green color called Spa. For the area behind the crib, I wanted something light and bright and map-related. I looked and looked but didn't find anything I really loved until I saw a multi-canvas map on the Kohl's website. It was kind of pricey, so I sent the link to my incredibly-talented hubby, and he made it on wood and painted it for me. What a winner, huh? I like to say that he can always tell our baby that he gave them the world. 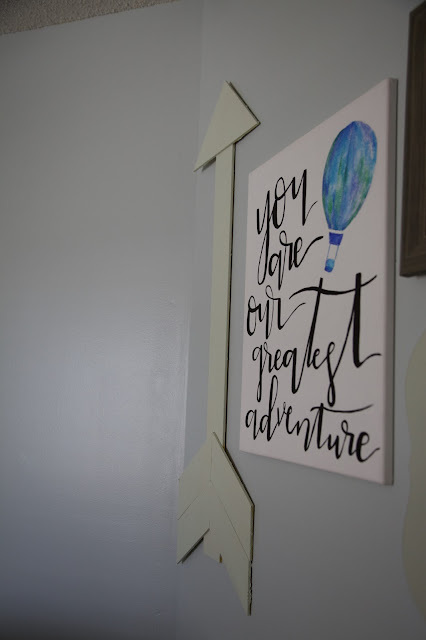 Aaron also made the arrows around the room, my brother and his girlfriend made us the super cute cloud mobile for me for Christmas, and a sweet YoungLife girl painted us the "You are Our Greatest Adventure" canvas. 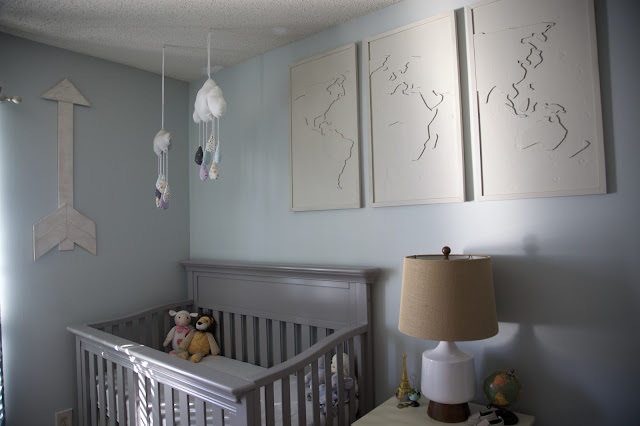 I love that so much of our room is decorated with meaningful, handmade items specifically created with Baby K in mind! All in all, I love this space and am so excited for all of the hours I'll spend with our sweet little one (and future babies after that). 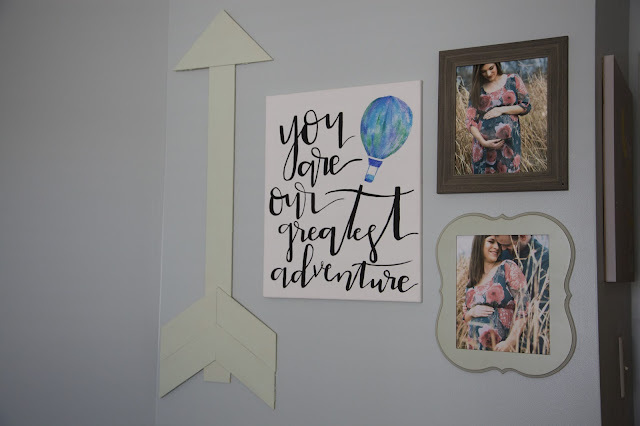 It's just the right mix of airy and light, and I love thinking about all of the adventures to come with Baby K- adventures that are even better than those we've had before! 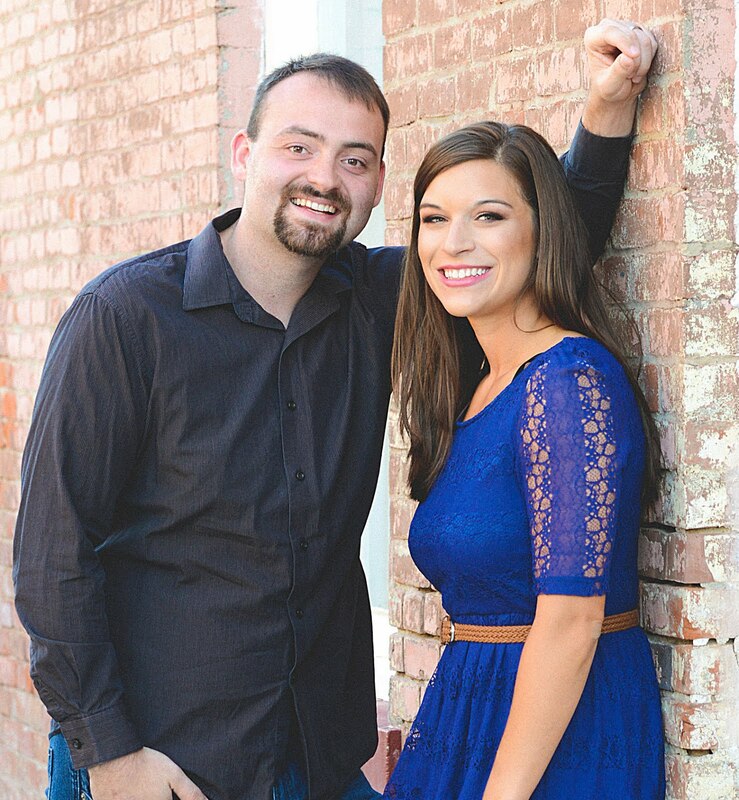 Are you following along on Pinterest, Instagram, and Facebook? 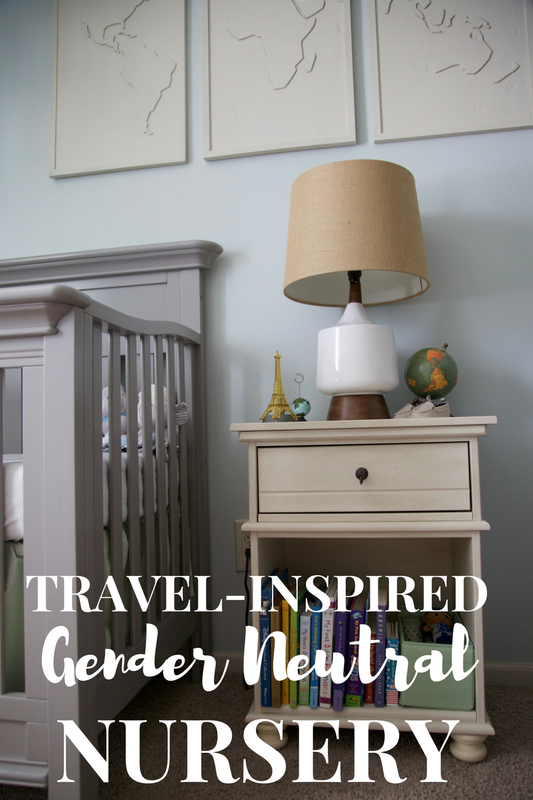 Be sure to join us for more home decor ideas, posts, and to meet Baby K! Looks ADORABLE! Looking forward to hearing if it is a girl or a boy!! So exciting. Thank you! Mr. Eli is here! I've been waiting for this! I love it, and I love that so many people are already loving this baby well. Splurging on the rocker/recliner was a great decision. We had a regular glider rocker for babies 1 and 2, and it worked fine, but my in-laws gifted us a rocker/recliner for 3 and it makes middle-of-the-night feedings so much more cozy. Thank you! It's definitely gotten its use already! This is too cute!! You did an amazing job! Can't wait for the arrival of Baby K! Thank you! It has been great already! Just in time ha! Thanks so much! It looks amazing! Love the world/map theme!! Love it! We are going for a similar nursery design and similarly gender neutral so I'll have to check out some of the colors, thanks for sharing. Awesome! Thanks so much, can't wait to see what you come up with! You did such an amazing job with this! I love all the gray and the fun adventure/travel details. 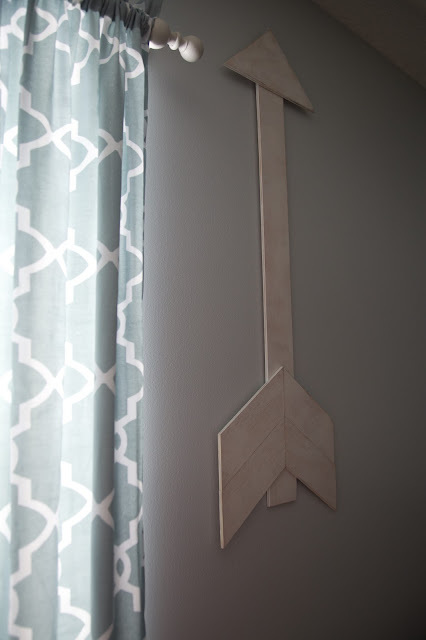 This is exactly how I envision decorating a room for a little boy! 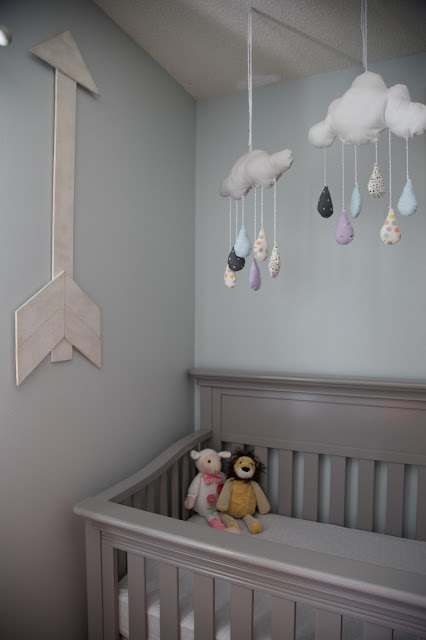 Bahhh, in my last comment I mentioned wanting to decorate a boys' room like this, and I keep forgetting you don't know the gender yet! True story: I've been thinking of Baby K as a boy from the very beginning. I can't wait to find out for real!! 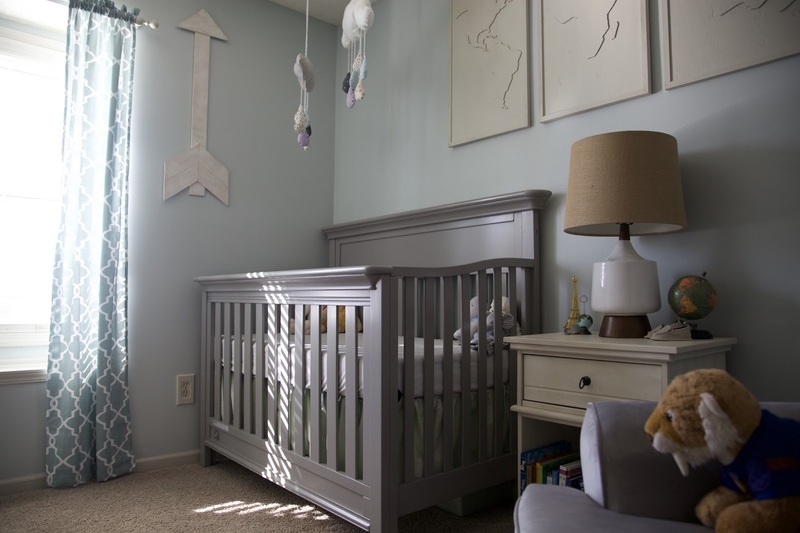 This is such a beautiful nursery!!! I love the way you styled it! And that lamp is to die for! Super cute room! I love the neutral colors and theme and how you have so many handmade personal touches, it really makes it special! Was it hard to pain the trim of the room? Did you do it yourself? All of our trim in our house is a Medium brown and I kind of hate it in the bedrooms. Thanks so much! My husband did the trim and it wasn't hard. He used a little guard protector so he didn't get paint on the wall or carpet! It's perfect, I love the colour combination and the art on the walls! LOVE this! Can't believe baby K is going to be here so soon! Thanks so much! Can't believe he is here! Such wonderful ideas! I'm going to be a grandmother this summer and although we know to expect Charlotte, I think these are great ideas for her too! Congratulations. This room is so perfect! i love the neutral colors! 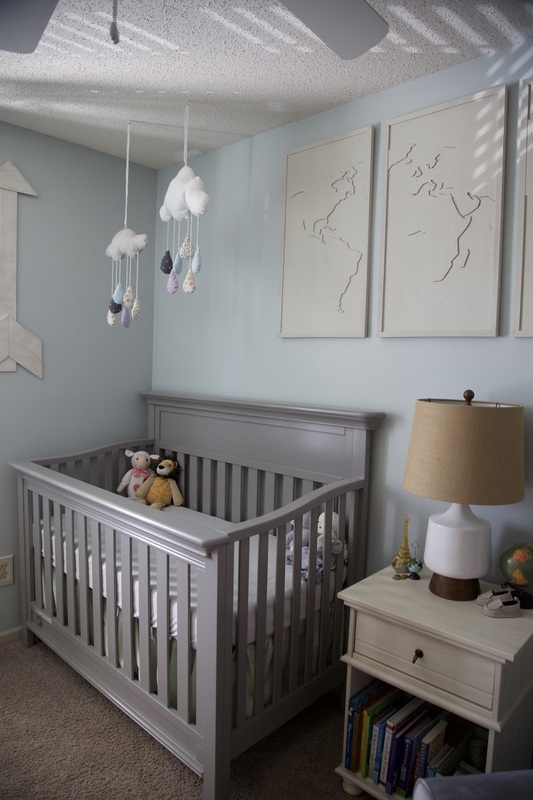 You've done an amazing job with the nursery! Everything looks so warm, serene and pretty. The "travel theme" is adorable! Congratulations and best of luck to you! I love this gender neutral nursery. The travel/adventure theme is perfect! I adore this! 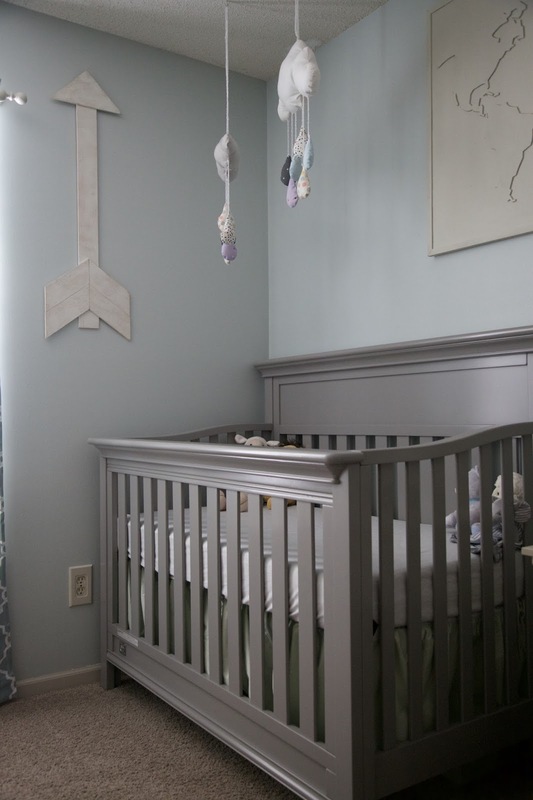 I plan to do a gender neutral nursery for my future babies too and I love gray and white together. So calming for Mama and baby I imagine! SO CUTE!! Your adventure theme goes perfect with the gender neutral colors. And I love that you gave new life to your childhood dresser/baby changing table. Thanks so much! It's been really great! Very nice! Next post: a tutorial on that awesome looking world map. Awesome job Aaron! And now we can really imagine Eli in his room! 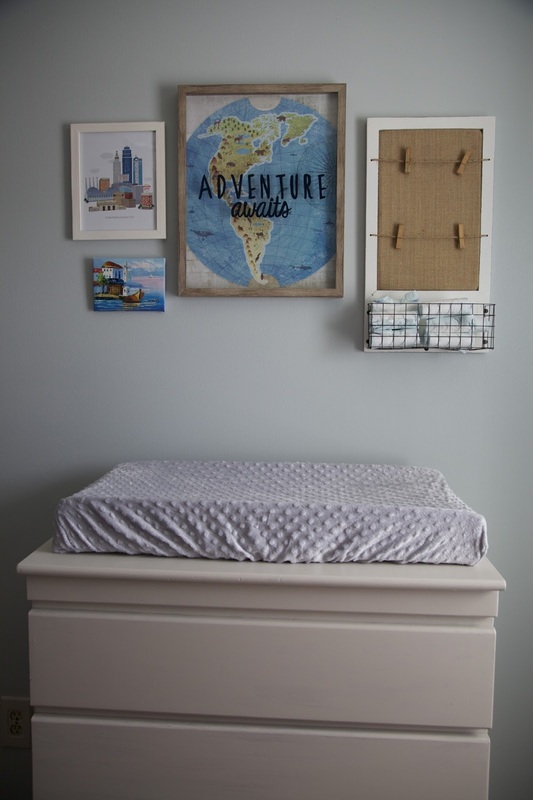 Great job with an inspiring nursery, Kelsie! Thanks so much! Can't wait for you to meet him! Oh it came together so well! It looks so lovely and perfect for whoever comes along. I love the travel theme and the little bits of UP dialogue. Thanks so much! We love that movie! How did your husband make the wall picture? Did he use a stencil? If so, where did he get it? Thank you! Sorry for the delayed response! 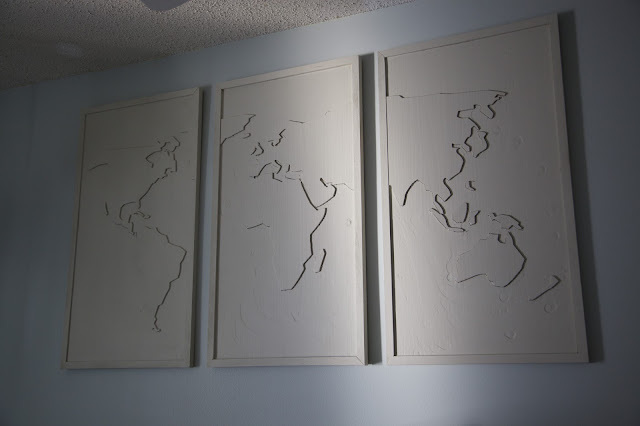 He just found a picture of the world online, and then printed it and used a CNC wood router. He has access to a woodshop. That may not be helpful, but I'm happy to answer any more questions you have! !